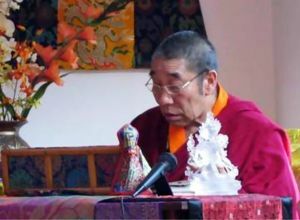 Tulku Sherdor joined Krishna Das at his Heart of Devotion Retreat at Garrison Institute on March 14, 2015, and presented a workshop on how chanting, guru yoga, and the GPS of devotion and compassion help channel our energies and activities into awakening. "Unimpeded, unconfined, fearless, non-dual awareness. Our most basic being, which is full of bliss, full of clarity, full of insight, full of compassion." "And that's why we're here." "But you knew that already." Be sure to stay tuned for the engaging Q&A session where "Nobody's asking about chanting in the Tibetan Buddhist tradition." New Moon Powa practice for practitioners of the Longchen Nyingtig tradition. This feast practice is held on the 10th day of each lunar month, and is mandatory for all Vajrayana practitioners to fulfill and to repair breaches in their sacred bonds with teachers, fellow practitioners, and meditation deities. Full Moon Powa practice for practitioners of the Longchen Nyingtig tradition. The Dakini Day Feast is held on the 25th day of each lunar month, and is a mandatory practice for Vajrayana practitioners to fulfill and to repair breaches in their spiritual bonds with their teachers, communities and meditation deities. What is new at Blazing Wisdom Institute. The Facebook page of Blazing Wisdom Institute and Tulku Sherdor, Director. A short list of sites we recommend. Here's a collection of photo galleries from Blazing Wisdom activities and travel.